An overview of the United States legal system, with a brief introduction to Islamic and International law, the book is divided into six parts. Part I (The Legal System and Crime) introduces the U.S. legal system and the classification of crime. Part II (White Collar Crime) covers cybercrime, crime the old fashioned way, and healthcare fraud. Part III (Homicide) deals with simple murder, serial murder, mass and spree murder; and assassination. Part IV (Special Groups) covers the mafia; the family; the medical, legal, and teaching professions; the religion profession; celebrities; and stupid criminals. Part V (On the Edge) deals with topics I consider to be a bit strange; that is, quackery, innovative defenses, and dangerous cults. And finally, Part VI (Residue) discusses what is left ... capital punishment and crimes against humanity, including terrorism. 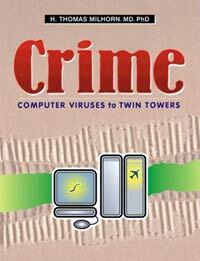 Throughout the book, to illustrate points, I have used over 300 cases of actual crimes. The names of the people and the facts of the cases used in the discussions of these crimes are taken directly from referenced news reports. - Who Commits Healthcare Fraud?